I work on image digitisation projects where we use Adobe’s Lightroom as a metadata entry tool. Our approach is to embed the core metadata in the IPTC fields of each image. When the images are ready for ingestion to the Web site, a script extracts the metadata and populated the database fields. This approach has the advantage that (1) the metadata remains with the image so orphan images issues and database migration should be easier in the future, and (2) metadata entry and ingestion can be divided into more discrete, manageable steps. IPTC fields are not designed for an image archive so we first had to map the fields we needed for the project onto the available IPTC fields to produce our in-house schema. This has not always been easy due to character length restrictions in the original IPTC specification. Some programs are more strict than others in applying field lengths, and we’ve found that new programs and even new versions of programs, have to be fully tested to see whether they truncate the data. Run Lightroom (or re-start it if it’s already running) and this template will appear in the drop-down list. Lightroom will remember which template you last used and will start with this next time. label = "Format of original"
label = "Creator of Original"
label = "Copy taken by"
label = "Date of copy"
label = "For citation use"
label = "Date of original"
If you make a mistake in the syntax Lightroom won’t tell you what’s wrong, it just won’t put your template into the drop-down list, so make sure your lines end with commas and the opening and closing braces balance. If you have questions or additional information about metadata field lists, please add them as a comment to this post. This entry was posted in Lightroom, Photography and tagged Lightroom, metadata, photography. Bookmark the permalink. Best article I’ve read in months regarding lightroom – thank you! Thank you so much! Do you happen to know how to create a drop down type field, I believe they call it an “enum” field? Excuse me if I’m not making any sense. I am brand new to Lightroom and trying to customize the metadata. Thanks for this article. Its awesome! I’ve been customising panels everywhere now – very useful. I’m very interested in being able to create panels that include drop down lists such as the one in the default “EXIF and IPTC” panel called “Copyright Status” – it has a drop down with 3 options ‘Copyrighted’, ‘Public Domain’ and ‘Unknown’. Would you happen to know how they are created? I’m afraid you’ve reached the known limits of what can be achieved with this scripting approach. I’m not aware of the ability to change the built-in copyright defaults, add drop-down lists or even add missing fields (like GPS Direction). It may be possible to do this via a plugin but that involves programming, which I don’t want to get involved in. 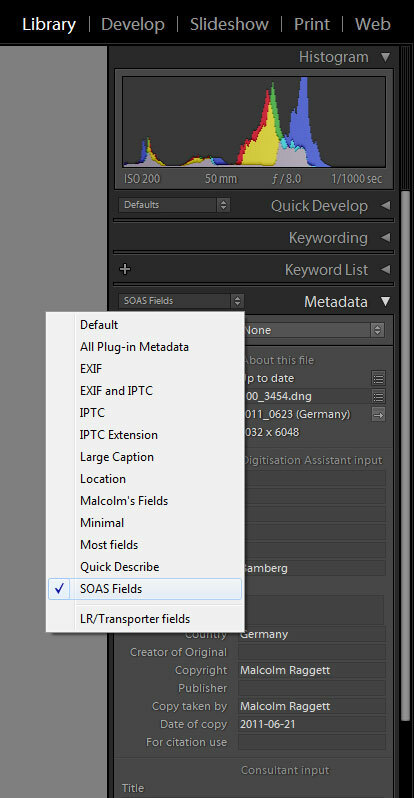 Your list was a great help as I too have had difficulty find out what adobe has called it’s fields. I can add userComment to this list. The field names are case sensitive, and one thing that does seem to be common is, if the field name consists of more than one word, the first letter of the first word is lower-case, but the first letter of all the other words is upper-case. Why it is this way, I haven’t the foggiest, but it has helped me locate a few other fields. Will – thanks for the addition of userComment to the list. I’ll amend my list above in case readers don’t look at this comment. Yes, it’s worth emphasizing that the field names are case sensitive and Adobe use camel-case, which is common in computer scripting (it makes names more readable when words are concatenated). If you have identified any more fields I’d be happy to add them too – I’m sure this will help the community. has the location for the .lrtemplate changed in lightroom 5? I followed your instructions- and havent even changed the code you present- but its not appearing in the drop down list… ; ( any thoughts? LR5 is just the same. You need to restart LR to re-read the folder. Does this make it appear? Hi Malcolm, I was wondering about this same thing – I am using the latest version of Lightroom (CC), and when I followed your instructions without changing your script, I was unable to get the settings to appear in the dropdown list. This did not change after restarting Lightroom. Has the location I need to put the script into changed in newer versions of the software? Are you still implementing custom labels in this way? Nat, the method of relabelling fields hasn’t changed through to the latest release. I’m using LR CC too and my metadata field list are still working. It’s always tricky balancing depth and detail without boring the reader. Is there some aspect you want me to elaborate? Nice article Malcolm, very useful to something I’m working on. Quickest way I’ve found to get all the usable field names is create a new meta-data preset, fill each field (doesn’t matter what) then save it as a new preset, find the preset under the [path]/Lightroom/Metadata Presets and then drag it in to a text editor.